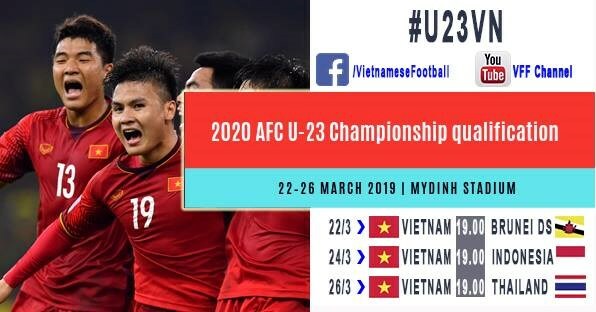 Hanoi (VNA) - Six matches of Group K within the framework of the 2020 Asian Football Confederation (AFC) U23 Championship, which are hosted by Vietnam, will be broadcast live nationwide, the Vietnam Football Federation (VFF) announced on March 18. Next Media Solutions JSC, as permitted by the VFF, will be the exclusive broadcaster and distributor of the broadcasting rights of the qualifier matches in all media platforms. The company has also successfully negotiated with international partners to obtain the broadcasting rights of qualification matches of other groups taking place in Indonesia and Thailand. Vietnam are in Group K along with Thailand, Indonesia and Brunei. All Group K matches will be held at the My Dinh National Stadium in Hanoi, Vietnam. Vietnam will face Brunei, Indonesia and Thailand on March 22, March 24 and March 26, respectively. Head coach Park Hang-seo has selected 37 players to prepare for these matches, many of them played for the U20 team that competed at the 2017 FIFA U20 World Cup, as well as U23 and national teams, such as Nguyen Quang Hai, Tran Dinh Trong, Doan Van Hau, Ha Duc Chinh and Nguyen Tien Linh.